← Her Name is What? They’re right. There’s something wrong with the narrative–I didn’t tell the whole truth. At the time that I was rewriting the ending of For the Love of a Dog for publication, I got cagey. I was going through a divorce. The more detail I sketched in, the more the portraits would show how we’d been dragged from the back of a Jeep through a Badlands of our own making. When it came to Pip, Joe would look especially tattered. I didn’t want my daughter’s father immortalized at his worst. Besides, in the matter of Joe’s character, I had little credibility. Who believes people when they trash-talk their soon-to-be exes? But those matters no longer concern me. Our daughter’s grown, and Joe has done enough in the intervening decade to shape her view of him without any help from me. She and I have discussed it, and now I’m free to share with you the rest of the story. Even so, writing about it now fills me with dread. So why do it? My crew having fun with a friend. First, there’s the natural inclination to vindicate myself (even though I know better than to read the Goodreads and Amazon reviews). Also, whether they write fiction or nonfiction, writers feel they owe the truth to those who cared enough about their characters to read all the way to the end. But I also want to right an artistic wrong. When I got to the part about what happened to Pip, my psychic defenses were at an all-time high. Whether the truth makes me look better or worse I don’t know, but that can’t matter anymore, not if I’m going to try to be any good at this art. In a way, it’s a psychic striptease. When it came to Pip, I not only covered up, I put on body armor. And now I’m going to take it off. Let’s see if I can at least get down to my lacy pants. The original manuscript of For the Love of a Dog ended with a family portrait—husband, eight-year-old daughter, dogs, cats, and me, pregnant with a second child. By the time the book got accepted for publication, I had lost the baby. That loss threw my already faltering marriage into a tailspin. Six months after I finished the manuscript of my book, (but a few months before it was accepted for publication), my daughter and I moved out of our family home to a neighboring town, and I looked for full-time work. Now I was poor. Food-stamp poor. I rented half a ramshackle ranch house, a far cry from the suburban neighborhood where we lived beside other professors from the local university. My daughter’s bedroom was windowless, and mine employed a curtain for one wall, but we had a yard, a hilltop view, and a road safe for children on bicycles. It was sunny, quiet, and remote from the unhappy valley where we’d lived with Joe. In fact, we were happy there despite our poverty, happier than we’d been in years. But the place had a catch: only one dog allowed. 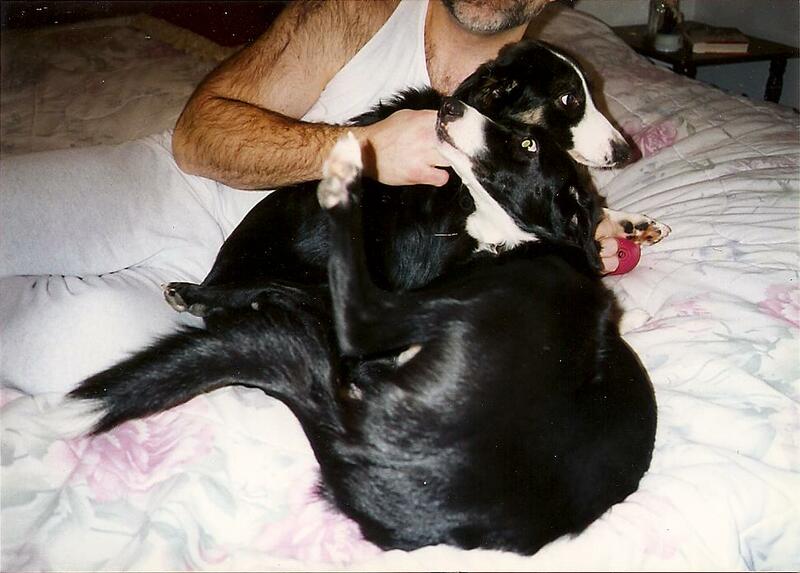 As some of you know, I had two Border collies, Pip and Casey. I had to make a “Sophie’s Choice,” at least a temporary one, until I had the means to bring home my other dog. For my daughter’s sake, I chose Casey. 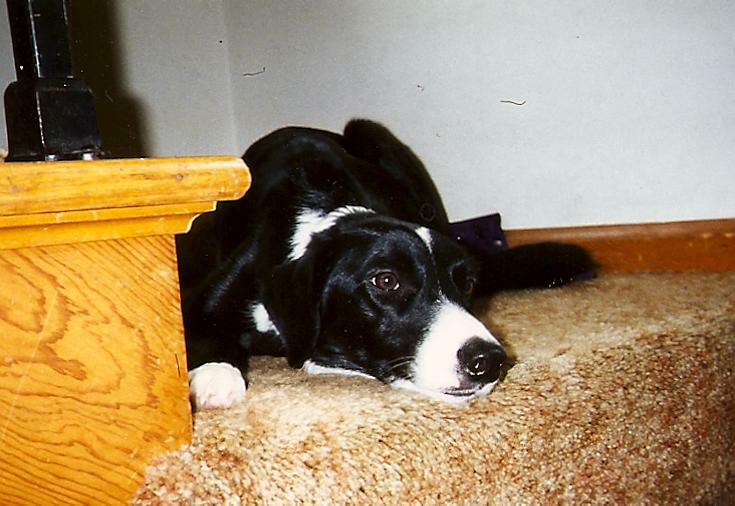 She was the dog who slept on the foot of my daughter’s bed, played “zoom-zoom” steeplechase with her in the yard, and had a high tolerance for little-girl dress-up games. 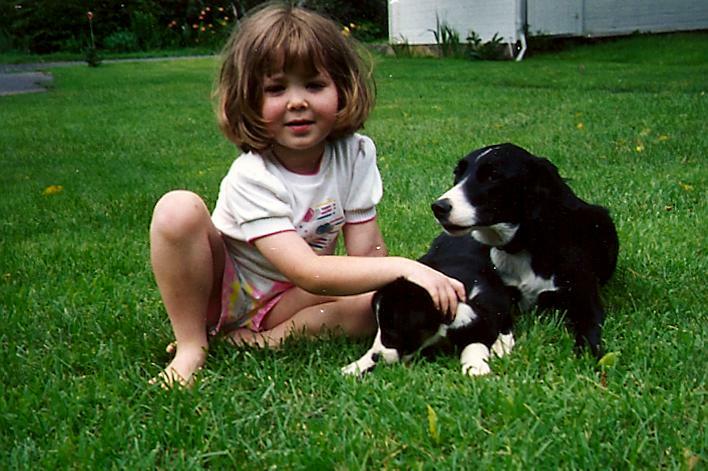 Casey helped preserve some vestige of life-as-my-daughter-knew-it, which was the most important thing to me at the time. I left behind Pip because I loved him best, and I believed divorcing parents should minimize self-interest as much as possible in such a shattering time. Pip was the dog of my heart, the one who slept on my bed, clattered the brass mail slot when I came up the front walk, and sang roo-roo songs of joy. The deal was this: Joe promised to keep my Pip-dog until I had full-time work and could afford to move someplace that allowed two dogs. After a few months, however, he went back on his promise, and just like that, (or so it seems in the book. You can read the original account here.) I turned Pip over to Border Collie Rescue. That’s the act that seems so out of character for me, so heartless. The truth, however, is perfectly in character, the opposite of heartless, but so ugly that it horrifies me to this day. While we lived nearby, our daughter spent alternate weekends with her father. At first, Casey joined her, jumping out of the car and trotting up the walk and through the front door with her tail swishing high. One Friday, Casey refused to hop out of the car. I had to pull on her leash and drag her out bodily. When I tried to lead her up the front walk, she lay down inert on the pavement. I was mystified. My knees went weak. I put Casey and my daughter back in the car and knocked on the door. Pip did not clatter the brass mail slot or sing his roo-roo song. Joe let me in. “Where’s Pip?” I said. 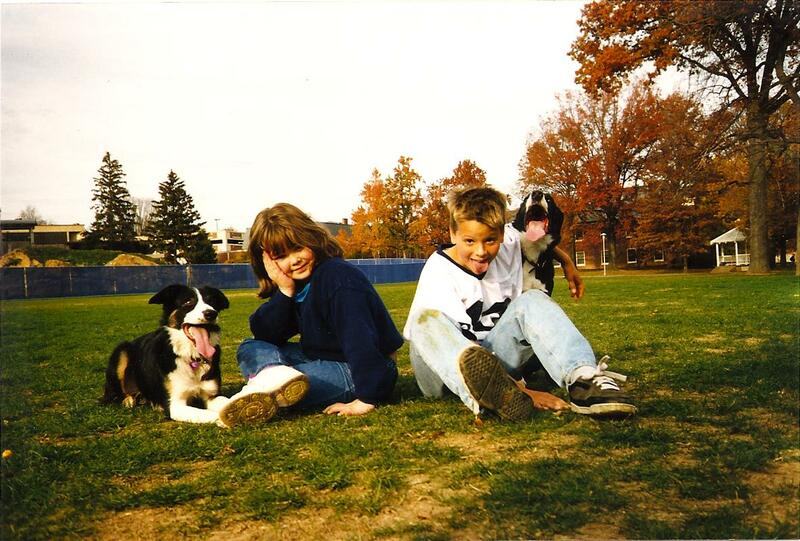 Delaney with Casey and Pip–the only siblings she ever had. “We’re both surprising each other, aren’t we?” Joe pressed the palms of his huge hands together and slid them back and forth, the way he did when he was moving words in his mind like chess pieces. For seven years, despite the fact that we were devout Catholics, he had refused to give me more children, which is why the miscarriage had been especially devastating to our marriage. 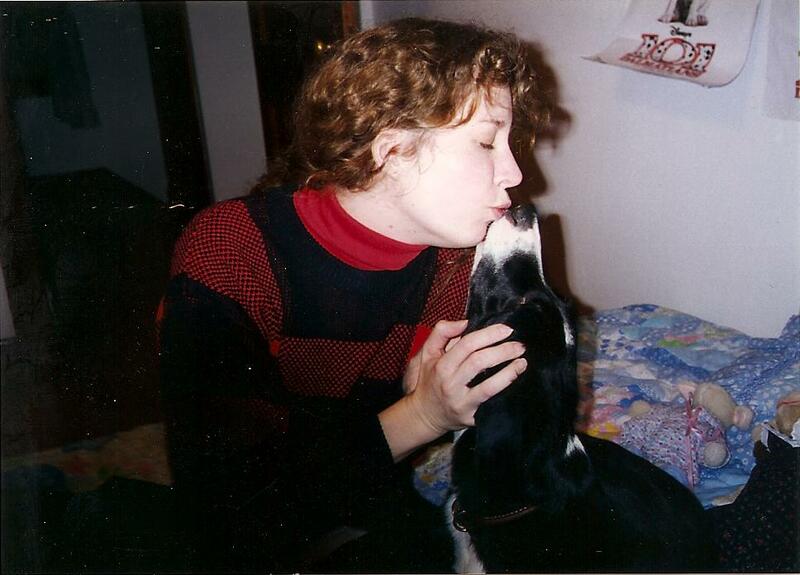 We glared at each other, and in the empty space between us, the dog years leapt up—two Border collies, two supercharged animals, intelligent, demanding, devoted, and completely dependent on me. They ran at my heels, busied my hours, and seized my imagination. They took from me what the children he denied me couldn’t. “I’ll take Casey.” He had his daughter’s childhood home. Now he wanted to take his daughter’s dog. Behind his words, lawyers lurked. “This is what you’re doing.” Joe tented his fingers. “You never asked me to stay. Not once.” As I gave way to abject sobbing, Pip slid off my lap. He slunk behind the couch again and didn’t come out, as if he, like Joe, (like the baby who died in my womb), had given up on me. When Pip hid himself again, I panicked. In fact, I got hysterical. I was slow to learn—the more I let Joe hurt me, the more he hated me. My dogs were always afraid of him. I didn’t know what to do. I sent Delaney into the house, drove off with Casey, and left the dog I loved with the man who loathed me. Maybe I deserved Joe’s wrath, but Pip didn’t. I couldn’t think straight. If he could beat our dog, could he beat our daughter? No, he wouldn’t hurt her. He was just angry at me. He was using Pip as my effigy. Did he want to kill me? Had he been abusive all along? Was I blind? The dogs had always been afraid of him, and I had made excuses. Would he kill Pip? I was so deeply shaken, I probably shouldn’t even have been driving. I regretted not taking Pip with me right then. I hadn’t known what to do. I had to act, and I had to act right away. Revelations about the ways in which I had screwed up my life seemed to be flying at me like circus knives every day. The months leading up to and following our separation seemed to be one long Hurricane Agnes, flooding towns, plowing up cemeteries, and leaving body parts strewn on everyone’s front porch. When you’re living with constant panic and grief, you don’t eat, you don’t sleep, and you’re in no condition to make big decisions. And yet during a divorce, you’re forced to make some of the most critical decisions of your life, I know. Perhaps I was especially ill-equipped to make them. One night before we separated, as we discussed divorce, Joe told me that in our marriage he had worked slowly, surely, inexorably, to make me feel incompetent. He said, “I knew if you ever figured out what you were capable of, you’d leave me.” Eleven years as his dependent had left me craven, and his contempt only made me more anxious to prove that despite all my considerable failures as a Catholic wife and mother, I was still someone trying to emulate Jesus and Mary, someone who put others before herself. So my knee-jerk reaction had been to save Pip from Joe by sacrificing my own need to keep my dog. I ran home and called Border Collie Rescue. The rescuer immediately removed Pip from Joe’s house, and within two days he was placed with a family happy to have him. The rescuer reassured me it was a good situation for him. It relieved me that Pip was safe, but I could not be comforted. I did the right thing—I had to get the dog out of there, and I did it right away. But fifteen years later, I go on second-guessing myself. That’s because if you had asked Pip, he’d have said he wanted to stay with his Lisa. And as for me, losing my Pippi was like losing another child. If I’d had the presence of mind to ask a friend to keep Pip for me (there are several loving people who come to mind), we wouldn’t have been separated long, and I could have visited him in the interim. No one knew what that dog meant to me better than Joe. You see, if I’d turned to friends for help, I would have had to explain why Pip couldn’t stay with Joe anymore. I didn’t understand, I didn’t believe, I couldn’t handle the truth that my husband had treated Pip and me this way. I’ll always pine away for Pip. Could I have taken Pip to my new home? I’d been trained for ten years to believe I was an incompetent adult. I was making little money–how could I maintain my high standard of veterinary care for two dogs? I would have had to violate my lease. But if I’d had more courage, I’m sure my kindly landlord would have understood. People lose all kinds of things in divorces—houses, friends, family, furniture, 401Ks, even their own children. Still, somehow, all these years later, I can’t make peace with the truth about Pip. It shouldn’t have happened. It shouldn’t have happened to Pip and me. I can’t forgive myself for letting my life get so out of control that I couldn’t keep him out of harm’s way. To me, losing Pip is the broken vow I regret most. Which isn’t very Catholic of me. But there it is. It’s interesting to me now, as I make this confession to you, to realize that I blame myself and not Joe. Yet if Joe hadn’t taken out his anger on Pip, Pip’s part of the story would have been a forgotten chapter rather than an everlasting grief to me. Pip was mine and my responsibility. I was the one who loved him. And when it came to choosing a mate for myself at twenty-four, I was an unforgivably bad judge of character. Another reason I find myself revisiting this matter is that an editor has expressed interest in re-releasing a new edition of this book. Can a memoir be updated? If so, how? This book, written in my early thirties, would certainly benefit from the reflection of me at fifty. 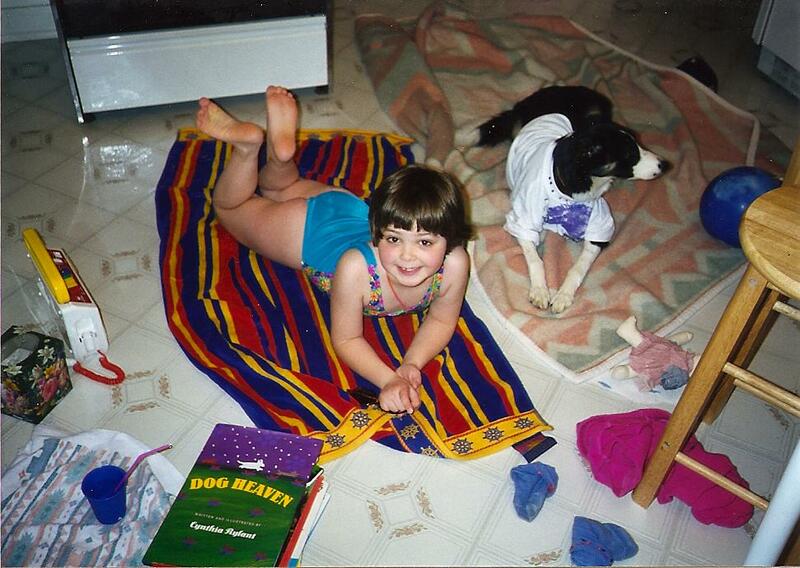 Plus, back in the eighties and early nineties, things were different for dogs. Much has changed in dog training and in our understanding of canine cognition. If I’m someday blessed enough to revisit that manuscript, I hope I can make it a wiser exploration of the ways in which dogs and other animals inhabit the sphere of our faith, our sins, and our redemption. This entry was posted in Inspiration and tagged border collies, creative nonfiction, dog behavior, dog stories, family, for the love of a dog, memoir, personal essays, rescue, rescue dogs. Bookmark the permalink. Thank you, Joy. I hope all is safe and happy with you now! “So often the ‘plot’ of a [memoir], its drama, its suspense,” Phillip Lopate wrote, “consists in watching how far the essayist can drop past his or her psychic defenses toward deeper levels of honesty.” . . . There’s something wrong with my narrative. 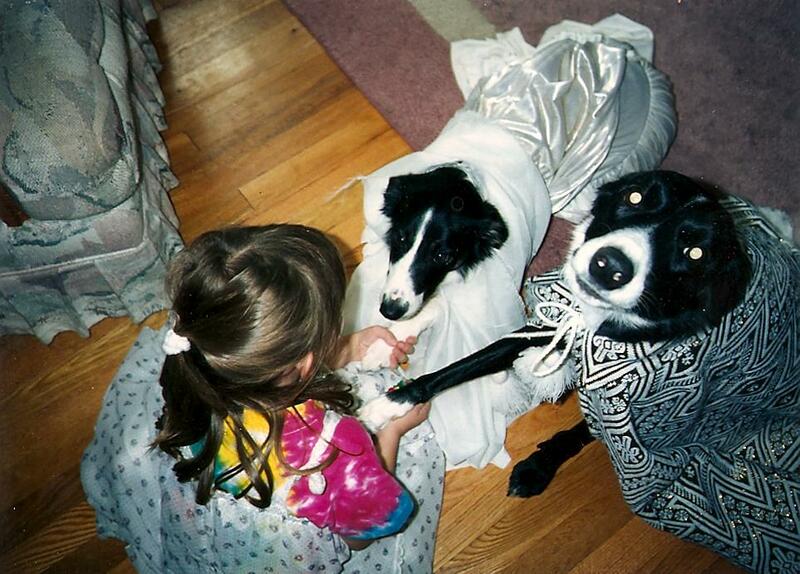 When it came to my Border Collie, Pip, my psychic defenses were at a lifetime high. My heart goes out to you! I can’t imagine losing a dog this way. Thank you for sharing your story. Thank you for reading. Thank you even more for commenting so compassionately. I feel hugged! And I after reliving all this, I needed it! I guess my love helped find him that new home. I’m sometimes frustrated not to know who adopted him. I wonder if his new “mom” ever found out he was a character in a book. I did ask the rescuer to pass on the good news when the book got published, but she was reluctant. I’d love to hear about how the rest of his life turned out and see photos. I wonder how Pip’s two moms might ever meet? This broke my heart. Utterly. It’s not your fault. But it’s all brought so vividly home. THis is courageous and so moving I am almost shaking myself. I hope you Do rewrite that ending with this one. Pip deserves it and so do you. Thank you–I appreciate your encouragement more than you can know. And thank you for pointing out that Pip deserves it. It’s a way I can put into action the love I still carry for him. Perhaps sometimes the reason grief persists is that we have unspent love. Heartbreaking, Lisa, but forgive yourself, please. You did the only possible thing at the time. Your psyche couldn’t take any more; ultimately, Pip was saved and loved. I have many of the same feelings about the mate that I chose (at age 22!). I, too, was made to feel incompetent and less important. I, too, heard the words, “You aren’t the same person I married. I liked being able to control you.” Having written this confession, allow yourself to look forward, to celebrate the triumph of the life you have now. Most of all, forgive yourself, because you *did* act when you might have sunk down and done nothing at all. Thank you, Colleen! Your kindness and understanding has touched me deeply. I do feel some relief, finally, after fifteen years, over this matter of the dog. I will share your words with the editor–I love the way you cast the revised ending as a celebration of triumph. Once again your writing has turned me to mush. You are so brave and fearless. Goodness! I’m not fearless. Not fearless at all. I can’t tell you how many times I chickened out while working on this essay. But hearing from people like you gives me courage. Thank you for helping me be brave! It must have been so difficult to finally write this down. I’m so sorry you had to go through this. Thank you, Kat. Funny how some things keep us wondering how we might have avoided them! That’s true. Sometimes we need to accept that some things happened to us for no reason. That it’s not out fault that someone mistreated us (or hurt our loved ones) it’s theirs. Everyone says they would leave when their parter treats them badly and then it happens and somehow many people don’t leave at least not at first. Taking your daughter away from this environment was the best thing you could do. It’s hard, isn’t it? It’s hard to believe the bad treatment is happening, hard to know what to do when there’s always so much more to your partner, and much of it good or he or she wouldn’t have become your partner, and hard to reach the conclusion that leaving is the best option. Many times women move out and then go back. I heard it takes an average of seven separations before the final one. Seven! And that’s an average! I didn’t know sever it’s an average. That’s crazy! It’s so important to talk about it openly to take away the shame. Wow–that is a great point. Oh, and I saw your touching post about how important it is to find a mate who loves your animals as much as you do. I love the photos! You reminded me how lucky I am to have found a dog-lover too, and wouldn’t you know, now my biggest worry is that he’s spoiling Mick! That’s great Lisa! I love worrying that my partner spoils our dogs (and he often does). Sometimes we have to go through certain experiences to be able to make better decisions later. I love scarred people and scarred dogs. I know what you mean! Amen to that! Lisa, thanks for sharing such painful and yet powerful moments of your life. Can a memoir be revised? Probably. But, do you want to rewrite history? You wrote “the truth” as you knew, felt, understood, and could speak of at the time. Regarding Pip, it is often said we get the dog we need, not the dog we want. I see Pip as your beacon for leaving an abusive relationship. How could you second guess yourself and possibly go back when Pip was there clearly showing you the rightness of your decisions. It took tremendous insight, courage and selfless love to rehome Pip. The woman you are today is a testament of the resilience of the human spirit. As a reader, I would like to hear of this journey and how the wisdom you gained through the years have “rewritten” those past life lessons and memories. My thoughts and just saying since you put it out there. Judy, I’m deeply touched by what you say. Thank you for loving thoughts. Yes, I would not rewrite history, so much has seek a more complete and insightful one. Memory, though, is ephemeral, and limited. This post has prompted reflection from my family on these events, fifteen years past now. They’re sharing information that I did not have at the time, and some of it is difficult, all of it fascinating. Plus, my daughter says her father read it and phoned her to apologize for all of it. The entire family is healing, and it’s a joyful thing! so, here is a thought … just my opinion. you might reconsider the ‘unforgiveable’ aspect of this observation. having recognized your actions at that time are none that you wish to repeat, and having accepted responsibility for what you wish you’d done differently, it seems to me that forgiveness is the most appropriate next step in healing. i know the toll of domestic violence first-hand. i also have come to recognize and accept choices i made as a result of living with domestic violence – choices i would never make again, some of which still make me cringe and weep when i re-visit them. making amends to myself and others, as appropriate, is ongoing. for me, self-forgiveness does not mean ‘it was not really that bad’, or any other kind of excuse for what happened. however, for me, forgiveness is essential to moving on and behaving with the greatest integrity i can in the present moment – hopefully ensuring that i do not repeat my earlier actions, to the best of my ability. i am tremendously moved by your offerings here. your candor creates space for all of us who share the experience to bear witness and heal with you. thank you. You are so right–thank you for your generosity of spirit! I certainly have learned and have built a peaceful life with someone who shares my way of living with dogs. And you’re right–forgiving ourselves and others, past and present, is ongoing, and, I believe, communal. When we hear each other, we heal each other.